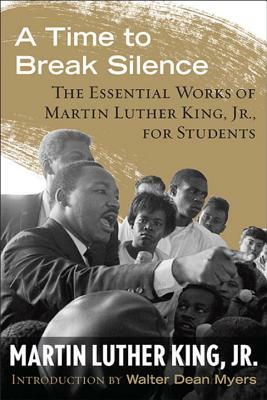 A Time to Break Silence presents Martin Luther King, Jr.'s most important writings and speeches—carefully selected by teachers across a variety of disciplines—in an accessible and user-friendly volume. Now, for the first time, teachers and students will be able to access Dr. King's writings not only electronically but in stand-alone book form. Arranged thematically in five parts, the collection includes nineteen selections and is introduced by award-winning author Walter Dean Myers. Included are some of Dr. King’s most well-known and frequently taught classic works, including “Letter from Birmingham Jail” and “I Have a Dream,” as well as lesser-known pieces such as “The Sword that Heals” and “What Is Your Life’s Blueprint?” that speak to issues young people face today. Dr. Martin Luther King, Jr. (1929–1968), Nobel Peace Prize laureate and architect of the nonviolent civil rights movement, was among the twentieth century’s most influential figures. One of the greatest orators in U.S. history, King was the author of several books, including Stride Toward Freedom: The Montgomery Story, The Trumpet of Conscience, Why We Can’t Wait, and Where Do We Go from Here: Chaos or Community? His speeches, sermons, and writings are inspirational and timeless. King was assassinated in Memphis, Tennessee, on April 4, 1968. Walter Dean Myers is the critically acclaimed best-selling author of more than eighty books for children and young adults. In 2012, Myers was named National Ambassador for Young People's Literature.